After eight years of working closely with the neighborhood, Brentwood School (est. 1972) is about to launch its bi-campus, four phase, 30-year Education Master Plan that will add a new middle school building, kindergarten building, specialty classes, middle school gym, upper school classroom building, upper school gym (replacing old one), lower school classroom building (replacing old one), upper school performing arts, and underground parking garage. All improvements are slated to be made within the existing campus’ boundaries, East housing middle upper grades and West with lower grades, and over the course of 30 years, with multi-year breaks between phases. East Campus enrollment will be increased from 695 to 960, to be phased in over four years following completion of the new Middle School Classroom Building. There will be no enrollment increase on the West Campus. Although Brentwood hopes to use the Veterans’ Administration property to usher in construction vehicles, due to a recent lawsuit it is looking unlikely. They have filed with the city and their DEIR is due out by the end of the year. If approved, their first three year phase would begin construction on Barrington and Sunset late 2016-early 2017, overlapping the entire duration of Archer’s project. another legally binding East Campus covenant that provides certainty for our neighbors and supports progress for our school for the next 30 years. 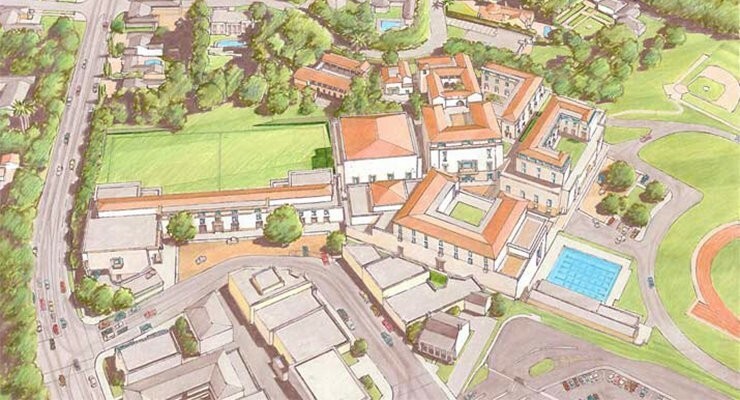 The result is the Education Master Plan that will improve the student experience at Brentwood School’s East and West Campuses. No new trips, with bi-annual monitoring and substantial monetary penalties for exceeding the agreed upon Trip Cap. No expansion of the current school boundaries. Construction hours limited to between 8:00 a.m. to 4:00 p.m.
For details, please read the Covenant. Johnson Favaro: The master plans describe accommodations for educational building sites, student life and activities, visual/performing arts, athletic/recreation, parking and other facilities that make the School and each of its divisions complete. A principal component of the plan is to identify facilities priorities for each of the divisions and a phased building program that allows the School to systematically and incrementally realize the plan over time as financial and human resources allow, beginning with the highest priority needs. The plan recognizes and creates a common vocabulary that gives a unified vision and clear identity through the built environment to the School’s philosophy, purpose and mission. The East Campus Plan identifies five new buildings, two parking garages and renovations of three existing buildings: the Science/Library/Theater, South Quad and North Quad. The West Campus Plan identifies three new buildings, two new parking garages and reconfiguration of the drop-off and pick-up area.